Hier finden Sie Reiseinformationen zu den verschiedensten Themen rund ums Reisen (Wandern, Fahrrad, Kanu, Kochen, Medizin etc. ), eine Reiselinksammlung und die Möglichkeit eigene Reiseberichte zu veröffentlichen. Ein Treffpunkt für Weltenbummler. Owned and managed by 4 friends Downtown Paraiso Hostel offers you comfortable and affordable accommodation on a perfect location. Situated in central Barcelona, 150 meters from the Ramblas, La Boqueria Market and the main tourist attractions, our place is designed for you to have a great time on a warm and friendly atmosphere. The Hostel has no curfew, no lock out, it's open 24hs. Easy to reach from all Airports, Bus and Train Stations and surrounded by cafés, restaurants, theatres, supermarkets, bakeries, laundromats, post office, and of course nightlife! Our rooms are clean and comfortable all newly decorated, most of them with en-suite facilities: Twins, Doubles and Dorms – so whether you are traveling solo or with your mates, there's always someone to go out with. They all have lockers where you can leave your things for free (just bring a padlock!) Bed linen, blankets and personal room keys provided. Also available for guest's use is a lounge and CABLE TV/DVD room with international channels. Hang out in the common room and chat with new friends or relax with a movie on our plasma TV (choose some DVD for free at the front desk!) High speed Internet access is available as well as free WiFi access for guests with their own laptop. We have a fully equipped kitchen to prepare your own meals and luggage–storage for free on the day you're checking out. You can check-in at any time. If you know you are arriving later than 10pm, please send us an e-mail with your booking reference number to let us know at what time you are going to arrive. Our staff is on hand to answer your queries 24hs, speaking Spanish, English, Italian, Greek, German and Portuguese. Downtown Paraiso Hostel is your home away from home and a brilliant place for making friends and enjoying all the sights Barcelona has to offer! Paris - Online Einkaufs- Reise- und Stadtführer zu Mode, Modelagenturen, Geschäften, Restaurants, Hotels, Bars und Klubs, Delikatessen, Kunst, Museen, Sport, Theatern . . . Located in the Heart of the City, in a safe area, just one block away from the historic Avenida de Mayo, and few steps from ALL mayor subway lines and buses which take you to the key places in the City. Ample rooms, with windows and balconies to the outside. 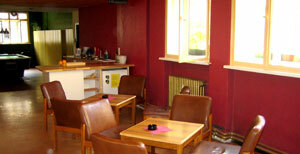 Common rooms with board games, pool tables, reading room and TV cable. Great Breakfast!!!!! Home made-warm bread home made marmalade croissants butter dulce de leche (a type of caramel) coffee tea…. all FREE! and no quantity limits…all you can eat.